Hire the whole person to attract top talent and ensure a job and cultural fit. 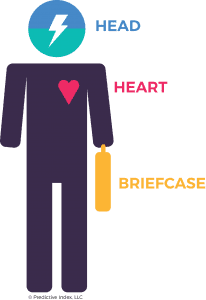 You need to look at the head, the heart and the briefcase. Workplace analytics gives employers the advantage of being able to look at data to find out if they have the right drive, the right temperament and learning ability to do the job. The Predictive Index Behavioural Assessment™ from Certified Partner Predictive Success takes approximately 6 minutes to complete. It uses an algorithm to analyze potential employees based on parameters such as dominance, extraversion, patience and formality. The system removes the human biases that even the most seasoned human resource recruiters usually possess. manage, sort, filter and favourite candidates in the recruitment process. The PI Cognitive Assessment™ delivered by Certified Partner, Predictive Success identifies candidates with a high potential for successful on-the-job performance by measuring their cognitive agility. The PI Cognitive Assessment™ is an essential component of any recruitment process and is an indicator of trainability for positions at all levels of an organization. Available in 70+ languages, it assists in accelerating onboarding and an employee’s capacity to handle complex business situations. – Brent Winterton,VP Human Resources, Chudleigh’s Ltd.